Add yet another threat to the list of problems facing the rapidly disappearing rainforests of Central America: drug trafficking. In an article in the journal Science, seven researchers who have done work in Central America point to growing evidence that drug trafficking threatens forests in remote areas of Honduras, Guatemala, Nicaragua and nearby countries. Traffickers are slashing down forests, often within protected areas, to make way for clandestine landing strips and roads to move drugs, and converting forests into agribusinesses to launder their drug profits, the researchers say. Much of this appears to be a response to U.S.-led anti-trafficking efforts, especially in Mexico, said Kendra McSweeney, lead author of the Science article and an associate professor of geography at The Ohio State University. "In response to the crackdown in Mexico, drug traffickers began moving south into Central America around 2007 to find new routes through remote areas to move their drugs from South America and get them to the United States," McSweeney said. "When drug traffickers moved in, they brought ecological devastation with them." 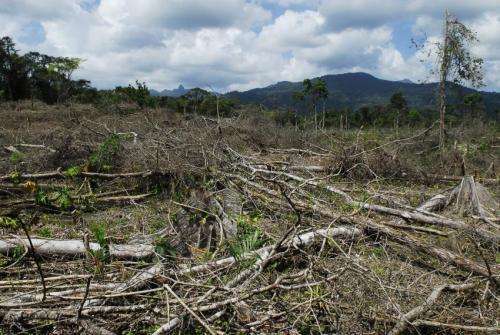 For example, the researchers found that the amount of new deforestation per year more than quadrupled in Honduras between 2007 and 2011—the same period when cocaine movements in the country also spiked. McSweeney is a geographer who has done research in Honduras for more than 20 years, studying how indigenous people interact with their environment. The drug trade is not something she would normally investigate, but it has been impossible to ignore in recent years, she said. "Starting about 2007, we started seeing rates of deforestation there that we had never seen before. When we asked the local people the reason, they would tell us: "los narcos" (drug traffickers)." There were other indications of drug trafficking taking place in the area. "I would get approached by people who wanted to change $20 bills in places where cash is very scarce and dollars are not the normal currency. When that starts happening, you know narcos are there," she said. When McSweeney talked to other researchers in Central America, they had similar stories. "The emerging impacts of narco-trafficking were being mentioned among people who worked in Central America, but usually just as a side conversation. We heard the same kinds of things from agricultural specialists, geographers, conservationists. Several of us decided we needed to bring more attention to this issue." In the Science article, McSweeney and her co-authors say deforestation starts with the clandestine roads and landing strips that traffickers create in the remote forests. The infusion of drug cash into these areas helps embolden resident ranchers, land speculators and timber traffickers to expand their activities, primarily at the expense of the indigenous people who are often key forest defenders. In addition, the drug traffickers themselves convert forest to agriculture as a way to launder their money. While much of this land conversion occurs within protected areas and is therefore illegal, drug traffickers often use their profits to influence government leaders to look the other way. McSweeney said more research is needed to examine the links between drug trafficking and conservation issues. But there is already enough evidence to show that U.S. drug policy has a much wider effect than is often realized. "Drug policies are also conservation policies, whether we realize it or not," McSweeney said. "U.S.-led militarized interdiction, for example, has succeeded mainly in moving traffickers around, driving them to operate in ever-more remote, biodiverse ecosystems. Reforming drug policies could alleviate some of the pressures on Central America's disappearing forests." More information: "Drug Policy as Conservation Policy: Narco-Deforestation," by	K. McSweeney et al. Science, 2014.